This project included a total of four buildings. Insulspan® products helped build two, Thayer Hall and the Highland Center. The goal of this project, initiated by the Appalachian Mountain Club (AMC), was creating an environmental education and lodging club. However, integrated sustainable design and restoration with the new facility, was key. This is because the building site at Crawford Notch is not new to development. Previous to this project, a hotel located on the site burned down in the 19th century. The hotel was rebuilt, only to burn down again in 1976. This environmental resort is located at Crawford Notch, White Mountains, New Hampshire. The type of buildings constructed are for commercial and educational use. One building was 10,000-square-feet, and the other 30,000-square-feet. Thus, energy efficiency was a vital part of the project. The goal…was to create an environmental education and lodging club that would integrate sustainable design and restoration. Energy efficiency is an important part of the Highland Center’s Design. All the buildings situate east to west in order to maximize daylight and summer breezes. 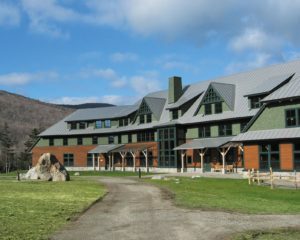 The design of the buildings and their materials had to work carefully with the ever-changing climate in Crawford Notch. The goals of the project encompassed the AMC principle of ‘sit lightly on the land.’ The buildings needed to include lodging, meeting facilities, staff offices, and environmental education venues. The design team integrated the historical structures with the new ones, creating a final and sustainable design that disturbed less than 2.5% of the proposed site. The choice of environmentally friendly design elements maintained the sustainability of the project. For example, the Highland Lodge dining room used formaldehyde-free, medium-density, fiberboard cabinets and 95% recycled gypsum wall board. It also utilized recycled wood. The goals of this process were able to be met through the combined efforts of the Appalachian Mountain Club and their architectural team, as well as their general contractor, the Keene, NH based, MacMillin, Co.
Each product and system in this project underwent consideration for both cost effectiveness and sustainability. Insulspan provided the structural insulated panels (SIPs) for the project. Choosing Insulspan was partially because Insulspan recycles scrap insulation during the process. Another reason? Insulspan does not blow-in insulation with ozone-depleting gases. Shaw provided a carpeting comprised of 89% percent recycled materials. The facilities also utilize indoor air quality techniques and water conservation elements such as low-volume faucets, composting toilets, and showers instead of tubs. The products and systems in this project were carefully considered for their cost effectiveness and sustainability features. The heating and cooling system uses a Biomass central boiler that burns locally harvested cord wood, scraps, and pallets. There are also heat recovery boilers and water heaters installed, helping reduce energy consumption. Found throughout the site are large amounts of recycled material. These recycled materials range from reclaimed timbers to ground up asphalt –used for gravel in the driveway. The architect saw the importance of incorporating the aesthetic and emotional elements from the historical buildings. The placement of buildings and arrangement of landscape added strength to the sustainable principle of the project. Project goals were successfully met with structures leveraging the energy efficiency and sustainability of the products and materials used. The benefits to the AMC are a beautiful complex of buildings providing facilities that reflect their principles and values of sustainability and nature. The community and others can come and learn more about sustainable design and energy efficiency by visiting the complex.